Catching Up & Giving Away - Birchbox Giveaway!! February brought my anniversary and Valentine's day. We celebrated our anniversary at the chef's table at Dante for the second year in a row. I cannot overstate how talented Chef Dante Boccuzzi and his staff are. Last year this quickly became one of our favorite go-to spots. Look for a full review next week. We headed to Dante on Saturday and I ended up making scallops and filet with manhattan sauce and caramelized onion pappardelle for dinner on Monday (our actual anniversary). The following Monday was V-day and we stayed in as well enjoying lobster tails and veal chops. 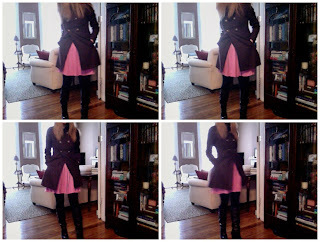 After posting about Valentine's dressing, I ended up going with plum and lavender. Now on to the good stuff. My first ever reader giveaway!! If February was the month of love, then March is the month of gifting. My birthday is at the end of the month and I thought I'd spend the next few weeks giving some gifts of my own. First up is a 3 month subscription to Birchbox! You might remember this from my review a few months ago. Birchbox is a monthly shipment of the best beauty and skincare products ranging from sample to travel size. It's a great way to treat yourself or a friend to a little fun and pampering. Every comment will be assigned a number and be chosen at random. The winner will be announced Thursday 3/17. Good luck!! I read this post hungry..bad idea! I was just on the Dante website yesterday, thanks to your recommendation via e-mail. Can't wait to try it out. Please count me in for the giveaway! My favorite new beauty item(s) are all of new Maybelline lipsticks that I blogged about. I went overboard and bought 6 of them and just want to play with them all day. the food you made looks AMAZING!!! My favorite new beauty product is primer for the eye lids - how did i live without this? I'm glad your back! I was going to post on your fb page soon to see where you had gone. I LOVE that you are doing this giveaway. I've been mesmerized with the birchbox since your posting on it. My current fave beauty project is a cheapie but goodie- L'oreal Elnett Hairspray. Wow...those dinners look incredible! What a great giveaway too...my current favorite beauty products are L'Occitane's Shea Butter face cream and hand cream. Considering how winter dry my face and hands are, these are lifesavers! I am on my second month of Birchbox and I LOVE it. I guess I would say that's my favorite new beauty product. That and the Makeup Forever HD foundation and their Smokey Lash. you are a TRUE chef my dear! after using estee lauder mascaras for literally over 15 year someone gave me a sample of rimmel last accelerator and i kinda love it. i'd love to try birchbox though!